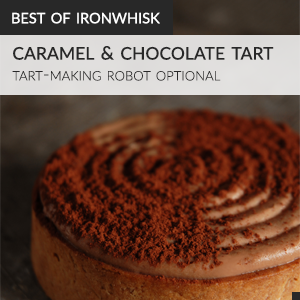 It’s important not only to have recipes but also proper technique in baking. I recently redesigned the website and added a new tutorial section. Every few weeks I’ll be posting a guide to help you master a skill. This time? Chiffon cake! Chiffon [SHE-fon] cake is a delicious, light airy cake made mainly with egg whites. It’s common in a lot of layer cakes in combination with fruit purees or just by itself, with whipped cream and berries. Ever had angel food cake? It’s almost the same! Improperly made chiffon cakes often have large bubbles in them that just don’t look right. These bubbles make it much harder to make a layer cake since they make the layers uneven. And, if these bubbles pop while baking, they’ll ruin the cake. Most recipes also result in a cake that “sinks” at the top and has uneven sides. Adding more flour to the recipe results in a cake that has a nicer appearance but is much drier. And if you use equal amounts of egg yolks and egg whites, then the cake may be nice and soft but the texture will just be odd. This guide will help you master the art of chiffon. To achieve a good chiffon cake it’s really important to control the oven temperature. This is much easier to do with an accurate oven. I suggest buying an oven thermometer to check how precise your oven is and to compensate accordingly. Accurate temperatures are important. They can make or crack (break) a chiffon cake. You have to be careful to not over bake the cake. Over baked chiffon cake rises, cracks, and then caves in on itself. It bakes negatively. It deflates! If you under bake it, then the cake sinks as soon as you take it out of the oven. Try to stick as close to the time indicated on the recipe. However, it’s best to over bake the cake than under bake it because it won’t even be cake-like if you under bake it. Eggs vary a lot in size. 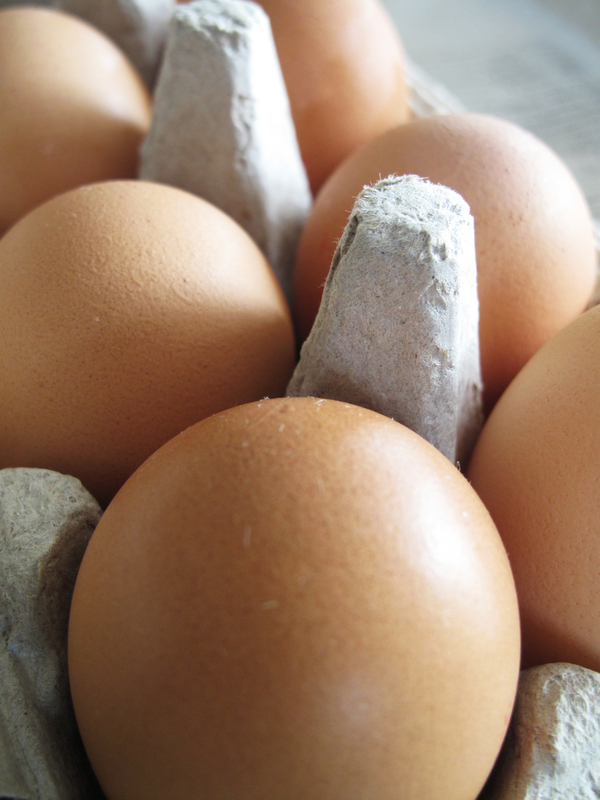 Most baking recipes are for large eggs, and using a different size of egg can cause your cake to behave strangely. I sometimes use extra large eggs in recipes but I find that for egg-based cakes, like chiffon cakes, it’s best to use large eggs. The amount of yolk and white in the cake can really affect its texture, so sticking to the recipe is important. Large eggs guarantee you do. I also recommend using fresher, room temperature eggs in the cake since they whip up better. Not only is room temperature important for the egg whites to whip up, but room temperature ingredients must almost always be used in baking because they ensure a better texture and shape. Fresher eggs whip up better as well. 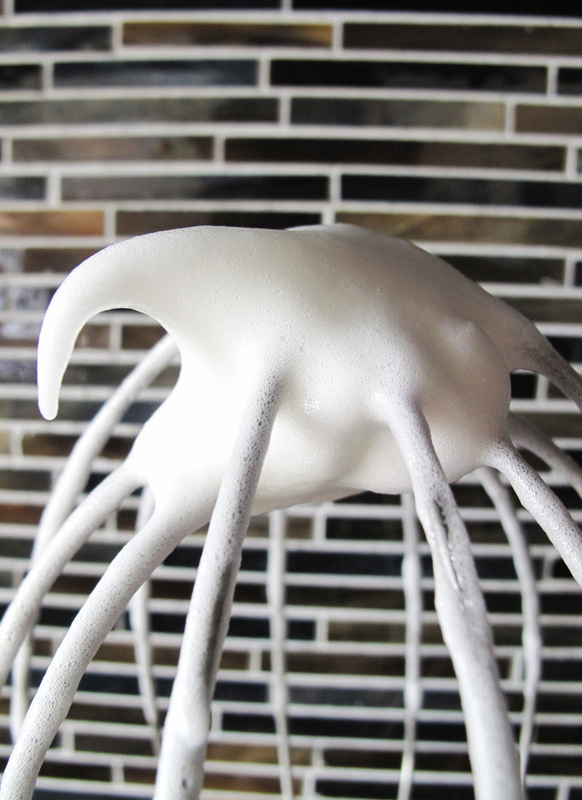 On especially humid days, avoid making chiffon cakes or meringues since egg whites do not whip up as well. When whisking the whites, make sure that the bowl is clean. Any oil or grease in the bowl will result in egg whites that don’t whip up as well. Just clean the bowl with hot water and soap. Just rinsing with water is not enough. Soap is able to emulsify the grease and take it off the bowl. I recommend adding the sugar and the cream of tartar right at the beginning with the egg whites. It doesn’t really matter when you add them, but if you always add them in the beginning you will achieve more consistent results. Don’t bother adding the sugar slowly while the egg whites are whipping. Beat on medium speed the entire time. 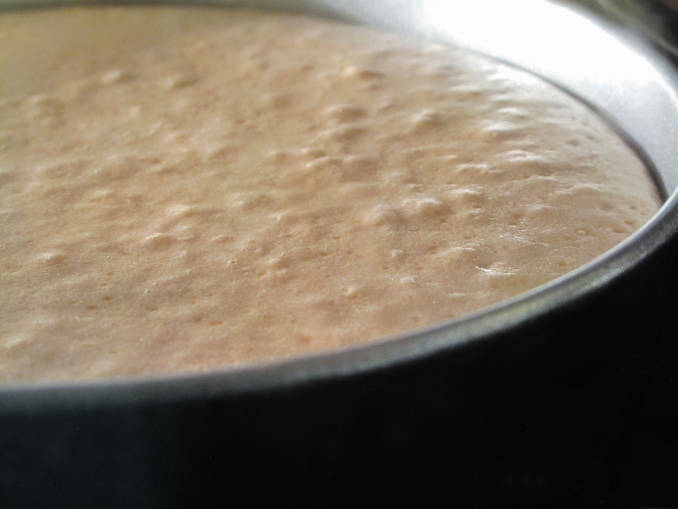 Avoid changing the mixing speed; this will ensure uniformly sized air bubbles in your cake. You want to whip the eggs until “medium” peaks form. When you take the whisk out and the peaks fall over on themselves the peaks are “soft”. When you take out the whisk and the peaks stay upright they are “stiff”. You want something between these two stages, where there is a half curl on the whisk when you take it out. Whipping to medium peaks still allows the egg whites to expand when in the oven, resulting in a light and fluffy cake. Some recipes recommend overbeating the egg whites, but it is not necessary. In fact, the reason some chiffon cakes are so dry is because of overbeaten egg whites (and too long of a baking time). Baking powder is not necessary. It’s more of a safety precaution in this cake. The egg whites will cause the cake to rise and be fluffy anyway, but the baking powder just makes sure. Do not add too much baking powder in hopes of getting a fluffier cake. It won’t work. 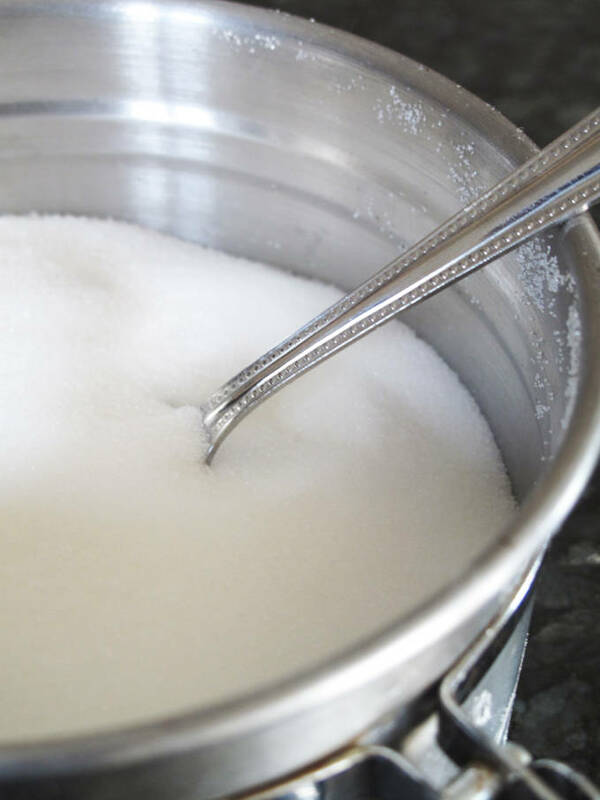 If you need a substitution, combine half the amount of baking soda with half the amount of cream of tartar. If you use self-rising flour, baking powder is probably not necessary. If you are make a chiffon cake that has fats, like oil or egg yolks, baking powder is necessary since it helps the cake rise by counteracting the effects of the fats on the cake rising. Pretty much any vegetable oil works. Oil is used instead of butter in chiffon cakes to give the cake a light, softer texture. That means don’t use melted butter as a substitution! You should use cake flour. Cake or pastry flour gives the cake a nicer texture than all-purpose flour. Substitute all-purpose flour for the cake flour by taking out two tablespoons of flour per cup of all-purpose flour and replacing it with cornstarch to create cake flour. Real cake flour does give a better result than this substitute, however. This is because the real difference between the two flours is the protein content of the wheat, not the amount of cornstarch (none). Cream of tartar is used to stabilize the egg whites so that they’re easier to whip up. Cream of tartar is potassium bitartrate, which is produced from tartaric acid. 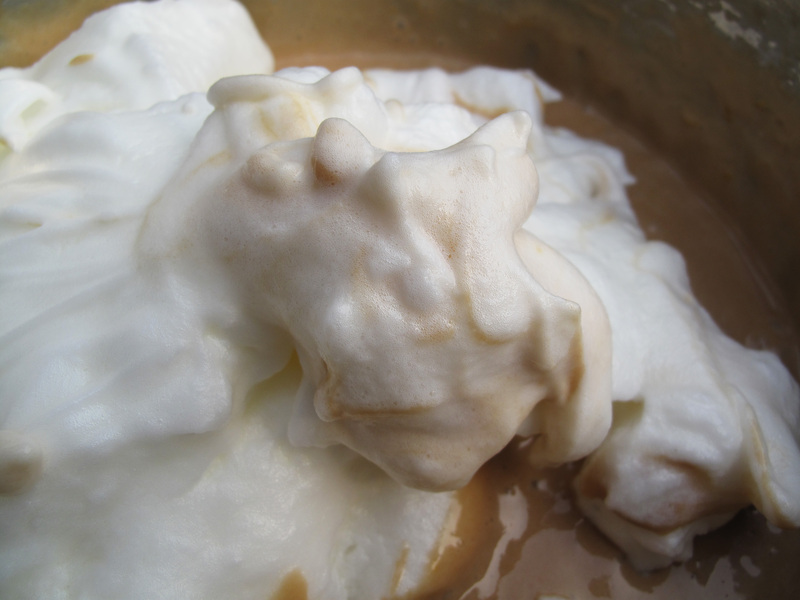 The acid reacts with the basic egg whites to help them get fluffy. It also prevents them from being over beaten. Generally, I use about 1/16th of a teaspoon of cream of tartar per egg white in chiffon cake. Fold the dry ingredients carefully into the egg whites. Fold carefully and slowly to not deflate the egg whites. Fold in one third of the egg whites first, to lighten the batter, and then fold in the rest. If you deflate the egg whites too much (over fold) then the cake will be dry and dense instead of fluffy. I recommend using a whisk to fold in the dry ingredients instead of a spatula. That way, the dry ingredients are incorporated without the egg whites deflating as much. Using a baking pan that’s the correct size is important. Traditionally, chiffon cakes are baked in tube pans because of their unique sides that allow the cakes to rise higher. Pans that are too large cause the batter near the sides of the pan to rise higher than the batter in the middle of the pan. This makes the cake cave in on itself. 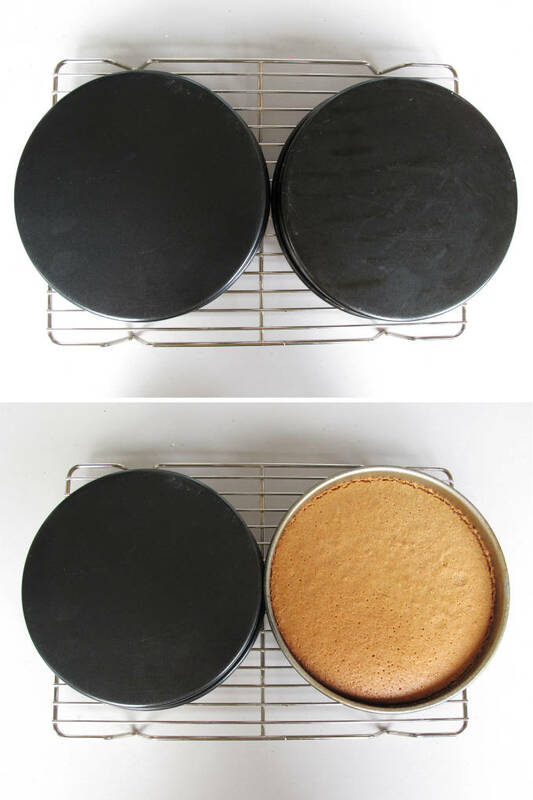 Properly sizes pans do the exact opposite, resulting in a properly baked cake. Do not grease the pan. Chiffon cakes cling to the sides to rise. If you grease the pan, they will not rise as high. Before pouring the batter into the pan, take the bowl and hit it against your counter. This will dislodge any air bubbles in the batter and cause them to rise to the top and pop. This ensures that there aren’t any strange bubbles on the cake. Pour the batter into the pan in one place. Try to avoid moving the pan while pouring the batter. This ensures that more bubbles do not form. Avoid hitting the pan against the counter after pouring the batter as this will create air bubbles at the bottom of the cake. 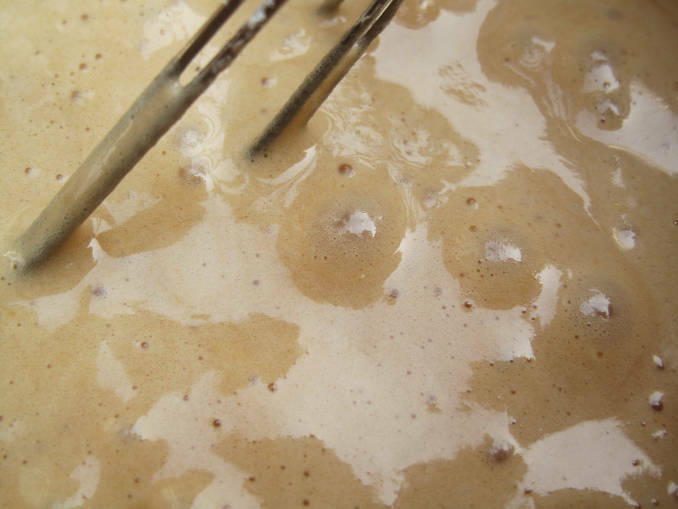 To minimize the amount of cracking, smooth the top of the cake batter with an angled spatula. Avoid using anything else as it could create more cracks. If you don’t have an angled spatula, it’s best to avoid this step entirely. You want to bake the cake at a fairly low temperature, around 325°F and as low in the oven as possible. When the cake begins to crack at the top, either turn the heat off at the top if your oven has that setting, or set a metal pan above the cake so that the top of the cake itself is cooler. Your cake may not crack. It’s alright. Don’t worry about it. Your cake may have a large bubble in it though. Don’t bother poking it with a stick. It won’t help deflate it. Once it’s done baking, it usually goes away. You want to have more heat from the bottom than the top so that the cake doesn’t become overly brown. The cake is done when it bounces back after being lightly pressed in the center. Some cakes may have crispy edges. This can be avoided by sticking to a low temperature and by making sure not to over bake the cake. Too much sugar can also make the cake crispy on the sides, but it is unlikely. Let the cake cool in the pan before taking it out or it may fall apart; it should cool completely in the pan. Invert the pan onto a cooling rack to prevent condensation from forming on the cake as soon as you take it out of the oven. The cake needs to cool upside down, with air flow underneath it. 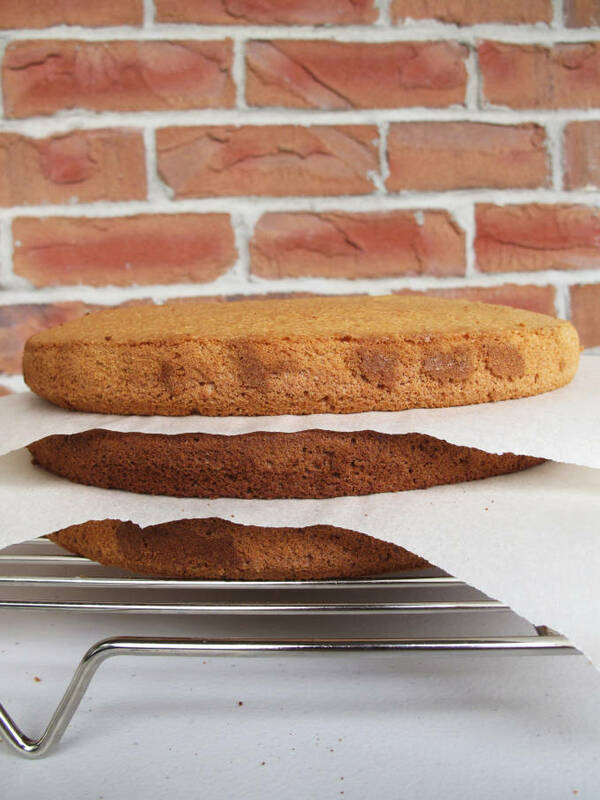 All chiffon cakes need to cool upside down so that they stretch down instead of collapsing. 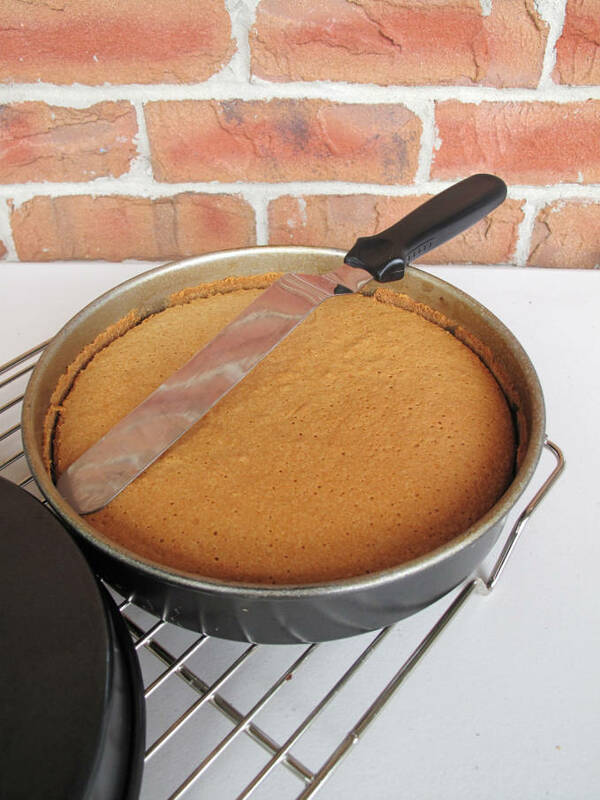 Use a sharp knife or angled spatula to separate the cake from the pan in one fluid movement, pressing the knife as close to the pan as possible. After the cake cools completely, serve as a layer cake with frosting and fruit. Or maybe with a dollop of whipped cream and fresh strawberries – it’s all up to you. I hope this tutorial will help you in your chiffon cake adventures. If you baked a chiffon cake and you’re still having troubles, please ask in the comments below! For the recipe for the Earl Grey chiffon cake with maple meringue in this post, click here. why is my chiffon cake is heavy and wet(crack too)? Dense chiffon is usually due to overly deflating your egg whites. Try to use the folding method I recommended. As for the cracks, remember to hit the bowl against the counter to dislodge air bubbles. These bubbles cause cracking. This sounds soo amazing!! :) And I am LOVING the new blog look!! You say that chifon cakes are cooked in a tube pan, but your pictures show a sandwich style cake tin, so can they be cooked in these cake pans as well? Chiffon cakes can be cooked in any pan as long as the walls of the pan are high enough so that while the cake bakes it doesn’t go over the walls of the pan. If you use a pan that is not as high, such as the one pictured, use less batter. h!! nice tutorial u have here. i need some advice on my chiffon cake. i just bake one yesterday. it is my 1st time. after cooling the cake, i found that my cake shrink quite a lot, as compared to your pic above. besides, i found that my cake is a bit wet but still very soft. any idea why? thx! You should try cooling the cake upside down to prevent it from shrinking. Hi, I am just wondering some of my chiffons after cooling when I take off the pan, the bottom cave in to the middle (not too much but it is noticeable) and sometimes it goes to almost 1 1/2 inches caved in… what do you think is the reason? Try increasing the amount of flour or baking it a bit less. Lovely! Cream of tarter is something I learned about not omitting the hard way…this cake makes me think of Christmas…I hope you have an amazing weekend, my friend!! I love chiffon cakes! My first try was my best. I think a light hand and fresh ingredients are best and don’t over think it! Just made a lemon chiffon (one I made a number of times before) and it looked lovely and tasted very nice as long as you had a nice cold glass of milk, water or a hot cup of coffee or tea with it. It was so dry and in hindsight I know why. I so over whipped the egg whites trying for the lightest of cakes and instead made the texture have a nice look but a papery taste. This is a great tutorial with excellent pictures. It should help in the elusive trip to make the perfect, ultimate chiffon cake. Thank you. just wanted to know if this cake can be layered and covered in fondant. Thanks. You definitely can, but I wouldn’t recommend it. Fondant is a bit heavy with chiffon. Hi, I just baked a chiffon cake with the tube pan today.however, when I turn it over to cool down, the cake fall off. What could be the reason? The tube pan I used is the non sticked type, is this the reason why it fall? Do you mean it fell out of the pan? If so, then it must be because the pan is non-stick. I would suggest getting a new pan not only for that reason, but mainly because you’ll get a much better rise with a pan that does not have a non-stick coating. I encountered the same problem however i checked my pan and its not a non-stick pan. What else could be the problem? I have tried numerous recipes and all my chiffon cakes caved in at the top after the cooling stage. The bottom of the cake rose perfectly but the top was always densed. What could be the reason? Hi Angie, if you tried multiple recipes it probably has less to do with the ingredients and more to do with the method. Perhaps you’re pulling out the cake a tad too early? Hi! Thanks for the tips on making a chiffon cake. I actually love carrot cake but hate the pieces of grated carrot because they are never fine enough for me. I was wondering it there a way to make a carrot chiffon cake but with puree instead of the grated carrot and how would that change the cake texture? Would I need to alter ingredients amounts to make sure it stays light and fluffy? Hmm. You could try making it like a pandan chiffon cake but substituting the pandan for, well, carrots. I am wondering if one could use baby food as a carrot puree. What do you think? HI. JUST WANNA ASK, HOW LONG CAN I KEEP MY CHIFFON CAKE MOIST AND SOFT? PARTY IS ON SUNDAY, CAN I MAKE THE CAKE ON FRIDAY AND SATURDAY THEN DO THE ICING ON SUNDAY MORNING? WILL THE CAKE STILL BE MOIST AND SOFT WHEN WRAPPED AND STORED IN THE FRIDGE? YOUR RESPONSE WILL BE HIGHLY APPRECIATED AND WILL SURELY BE OF BIG HELP FOR MY SON’S FIRST BIRTHDAY. Hi, so sorry for the late reply! I wouldn’t recommend keeping the cake out for so long. I would try to do it all on Saturday. Hi, I have tried to bake the pandan chiffon cake a few times but each time half way during the baking (about 15 mins after in the oven at 150 C fan force), the top of the cake start cracking. Can you please let me know what I have done wrong and how to avoid it. Thanks. Hi Virginia, you might just be overbaking the cake or have too much heat from the top of your oven. Try covering it on top with some tinfoil half way through the cooking process. If all else fails, flip the cake upside down to hide the cracks. Good luck! Could you please tell me what I am doing wrong. The chocolate chiffon cake is dense on the bottom. I have been making this cake for years w/out problems. Suddenly, I have made 5 of these all with the same issue. Hi Dee, sounds like you’re having the same problem Jane is. I would also recommend making sure that all your ingredients are well incorporated, and recommend making sure you’re not over mixing. Hi! Came across your website. I tried to bake a pandan chiffon cake and to my horror, the bottom was dense while the top was light and fluffy. What could have went wrong? Hi Jane, it sounds like you didn’t incorporate all the ingredients well enough. Fold everything together – but not too much! Practice makes perfect. what about if i use High ratio flour? what is the different by using cake flour or high ratio flour? i am more on healthy conscious way, which flour should i use is for better texture & more on healthy way? Sorry, i have a question; Actually when i make shiffon cakes, during baking first i c that the cake raised very well; but then around 30 min or something later, during baakjing i see that my cake’s rise sits a little! do u know the reason? Hi Celin, you’re most likely overbaking the cake if it deflates in the oven. Thanks for yr reply; but do u mean overbeating of the whites or the general batter? where should i look for the problem? Hi Celin, I’m saying you’re overbaking the chiffon cake, not overbeating. Oh thank you very much for you comments; i repeated it once more; and it seems you are right; i have to take it out of the oven on around 35-40 min baking. Otherwise it starts shrinking and losing it’s height. Thanks once more for the great help. Thank you so much for this complete tutorial. The internet is truly a different way for humans to communicate, and I am seeing so much sharing and generosity: Thank you for taking the time to not only explain every step, but explain the why as well and include tips. I have flopped two chiffons in two days: They look fine in the oven but flop and deflate within 2 minutes of taking them out. I think the first time is because I greased the pan. The second time I did not grease, but I did line the bottom only of the pan with parchment paper. Could that be my mistake? On another note, I am making this for a dessert for my parents’ fiftieth anniversary…a very special occasion and I do not want the dessert to be a flop! I was going to heavily wrap the completely cooled cake and freeze so I could assemble it the day of the anniversary. Do you think that would be alright? I can’t make the cake the day before because I have other commitments. Besides, I want to be sure the cake turns out ahead of time, if not, I’ll have to find something else. Any recommendations? Again, thank you for your time and generosity. Hi Beatrice, thank you for your kind words. I’m glad to help! Are you flipping the chiffons over when you take them out of the oven? You should do that. Also, it might be that you’re over baking the cake. Try taking it out a little bit earlier. Regarding freezing the cake, I haven’t done that before so I’m not sure how well it would work. Super sorry! Perhaps just keeping it in an airtight container would be a better idea. What does ‘assembly’ entail? Maybe doing it all ahead of time would help keep the cake moist depending on what you plan to do. I am not a very good cook, despite my years in a kitchen after 8 kids!!! My problem is lack of understanding of the basics and lack of imagination and creativity. Oh well, to each his own, I guess…. This is why I really appreciate this tutorial and your help: I can’t believe I got such a fast reply – thanks! Wish me luck. I’ll let you know how it turns out! Joy to the world, my cake turned out!! Thank you so much! Only thing was that the cake was pretty stuck to the bottom….some acrobatics with a soft spatula did the trick, but my heart skipped a few beats thinking it was going to break apart. So the bottom looks a little bumpy, but no problem, I’ll just make sure it stays as the bottom! One advantage is that the little bits that stuck to the pan gave me a chance to pre-taste before the big event and it was yummmy! So you can take part of the credit for my parents’ fiftieth celebration being a success!!! Thank you again. My cake sticks to the pan after cooling and breaks when I try to take it out. Is there a way that without greasing or lining it comes out clean and doesn’t break? It might be that you’re under baking the cake, which could cause it to stick to the pan. Try baking it a little more perhaps. Hi Bakergal, I always keep my chiffon cake in an air tight container on the counter. Did you cool your cake upside down? Are you confident that you didn’t over bake it? I baked it for 40 mins at 190 degrees centigrade following another recipe as I didn’t find your site till today :) . But I did not cool it upside down; so you think that could be a possible reason for it losing its fluffiness? Hmm looks like I will have to attempt this again, and this time using your recipe. Wish me luck! Thanks for your prompt reply. Appreciate it. Cooling it upside down helps prevent it from deflating. Also try baking it for a few minutes less. Let me know how it goes! I made my chiffon cake in the paper cups. When I take them out from oven, the cake sink in the middle, can I know what causes it. I melt cheese and butter for my cheese chiffon cupcakes, do I did it right? Thanks! Hi Adeline, I would suggest baking it for a few more minutes and making sure to cool it upside down. Let me know if that helps! I find your tutorial very useful. Thanks so much. I have a question. When you say turn the cake upside down, should I remove it form the pan with the tube in the middle or just turn the whole cake in the tray upside down. Hi, thanks so much! Turn the entire pan upside down until it cools completely. Happy baking! My mom always used to make chiffon cakes for my birthday. I’ve made about 3 of them since she’s been gone, and they are always “short,” meaning they only come up about 2/3 the height of the pan. They don’t deflate; they are just short when I pull them out. Yes, I cool on a bottle, and yes, I am careful not to contaminate the meringue and try not to lose too much volume when combining it. What am I doing wrong? I can usually only slice these in two instead of 3. Is it necessary to use a tube pan? I have used a removable base pan but my chiffon does not rise as high. So not sure if it could be not using tube pan? Also the bottom is usually slightly wet and had difficulty removing it. Hi Rachel, a tube pan does help make the cake rise a little higher, but it’s not a huge deal. Try baking the chiffon for slightly more. Might help! Hi, my cake always caves in the middle. I used 5 eggs and turned oven to fan forced at 150 degree for 60 minus. Is it right? Hi Kathy – the temperature and number of eggs depends on the recipe. When does your cake cave in the middle? Before or after baking? Your tutorial is amazing, thank you! I had a problem making my chiffon cake. I baked three 10 inch cake, I never had any problem with my recipe, but this time around my cake was so dry and crumbly. What could it be? I baked it at 325 degrees. Is it because I took it out of the pan b4 it cooled, and caused the cake to dry out? Is that possible? Hi Cathy, you probably baked it for too long. My orange chiffon cake was rising nicely in the oven and I baked it a 180 deg C for 45 mins. After cooling for about 30 mins (inverted) on a rack, it had dislodged itself from the pan and collapsed, leaving a top that seems dense. Actually, there were 2 layers — a nice soft bottom and a top (now inverted — that was harder) The rest of the cake was soft though. Any idea what I did wrong? How do I check for doneness? I used a toothpick. When it came out clean, I removed the cake from the oven. Hi, I have just baked a pandan chiffon. It went well (no cracks, rose normally, didn’t deflate or caved in, side still sticking to the pan and I had to peel from the wall of the pan, bounced back when pressed etc) but! Upon unmoulding it, I was disappointed to see no browning, in fact, the cake looked “under baked”, pale and moist, why is this so? I was so tempted to put it back to the oven to brown it…did I over or under baked my cake? Appreciate your advice, thanks!! If it tastes fine, then it’s good! It’s hard to tell what you mean by no browning. Usually pandan chiffons are quite green. Hmm, sorry I’m not sure! Perhaps try cooking it at a higher temperature? Hi, I wanna ask if I’m using normal baking pan, should I lined or greased the pan? I wish I’d seen your tutorial before I made my cake! 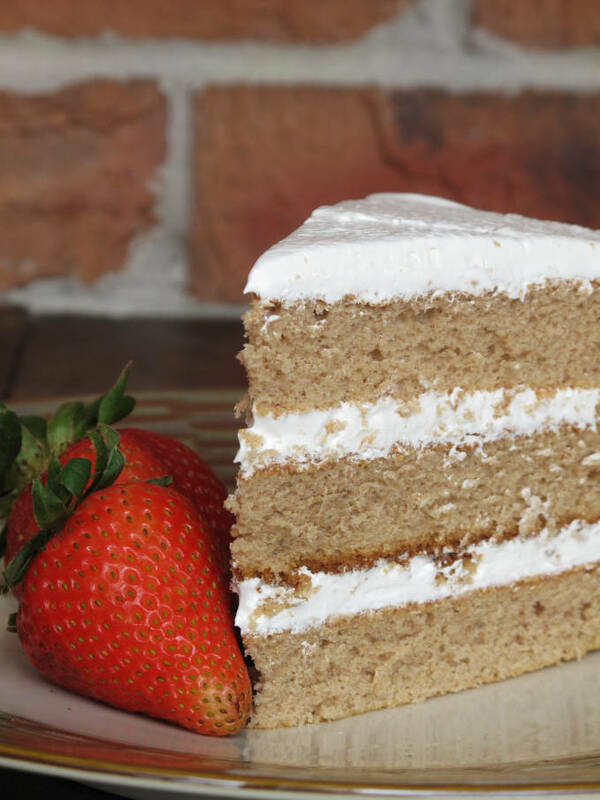 I have a question….can I freeze a chiffon cake? Or does it have to be eaten the same day? Sorry, I’m not sure! Never done it before. If you do go and freeze it, please let me know how it works out! I made a similar recipe (Lemon Heaven Cake) but it didn’t call for cream of tartar. It looked and tasted fine but I thought the texture was a bit rubbery. Any idea why? No, sorry! I never encountered that issue. Hi!! I am doing a presentation on Chiffon Cake and this was really helpfull when i had to describe what the ingredients are used for. I did not know you didnt have to use cream of tar tar before i had read this. Im making an Orange Chiffon Cake tomorrow for my class. I hope it comes out good, we are using a Bullfer pan i think that what its called it starts with a B.
I baked Chiffon cakes few times, whether chocolate or orange flavour, it always fall out whenever i invert them. (That means the outer burn skin is not there, but stick to the pan) The main problem is the Orange chiffon, it is always wet on the bottom, the side, It is not spongy and light, but wet and sticky. What could be the cause? I baked for 60mins and still wet…. And why it always fall out? Too heavy? Not light enough? Hi.I baked a chiffon cake yesterday and noticed that the texture is moist and soft with abit of dampness at the bottom.does that mean it’s undercooked? I also noticed that the chiffon cakes I had baked so far aren’t as tall as what they should be.May I know the reason? Thank you so much for the detailed tutorial. I am 72 years old and lately into baking chiffon cakes as I am lactose intolerant, so no milk, butter and cheese suit me very well. I have baked the pandan chiffon, chocolate chiffon and orange chiffon. I must say the cakes turned out well except for the pandan. When un-mold , was a bit wet at the bottom. In addition, why the cake does not rise high enough and not so fluffy. temperature and oven function? I bake at 160 top and bottom function in oven, is this correct. Hi, thank you for the tutorial. Whenever I baked the chiffon cake in a removable base pan the top always turns a bit damp & pasty the next day. I had to bake the sponge a day earlier so I can slice & layer it with fruit & cream for a birthday cake. When I bake it in a tube pan this does not happen. Can you tell me why this occurs ? Thanking you in advance. My question is. I love the texture and taste of my orange chiffon cake. I have been using paper cup cake. I did not turn upside down to cool!!! Is that one of the reasons my cup cakes are dry and the cup cakes in the ends are burnt in the bottom. Hi, I’m baking my chiffon cake in a regular pans. You mentioned not to grease the pan which means i don’t even place a baking part at the bottom to line it? In that case, how do u remove the cake after it’s cool upside down? I could scrape the sides with a knife but the bottom will still stick right? I have made many chiffon cakes successfully. I made an orange cranberry walnut one I always make . It looked great when I took it out of the oven. I immediately inverted it on to a bottle and turned to do the dishes. When I looked at the cake after about five minutes, half of the cake had fallen into the counter! I have a new oven. I cooked the cake at 325 for 55 minutes. The cake tester came out clean when I tested the cake, and the top of the cake sprang back when touched. What could be the problem? Please help! Hi,i baked a vanilla chiffon cake in airfryer but it didn’t raise and i used white vinegar in place of cream of tartar, just doubled the quantity and the recipe calls for 6tbsp cake flour instead of which i used 4tbsp of all purpose flour,i baked it 130°c(not at 150°c because of airfryer ) for first 20 mins and then reduced the temperature to 110°c for further 40 mins.it was my first attempt so im not sure where i got wrong,please help! I have been baking chiffon pandan quite for a long time and recently am having the problem while unmoulding got part of the cake is empty. I want to know what’s wrong. My aunt recipe is simple .. But even though coling upside down top top shrinks slightly .. why is this? Posting a tutorial makes me think you have researched and tried every aspect of for instance, this chiffon cake…. so that when someone has a question, you have the answer. Instead your reply is that you don’t know or haven’t tried it. If you want to portray yourself as an authority on the subject you should have all the answers. It sounds to me that you really don’t do as much baking as we thought.